The regular cost for a Wyoming Office program is $75 per month + booking fee for actual usage of desk and conference room. You can also pay additional $75 and we will not charge usage fee (monthly total will be $150). We do automatic billing each month to your credit card on file. We offer 40% discount if you pre-pay the basic fee 12 months in advance. The monthly cost will then be only $45. We need to have signed contract to process order. Therefore we accept new orders only by fax. Why should you have a business address in the state of Wyoming? The state of Wyoming does not require a business incorporating under NRS Chapter 78 or NRS Chapter 78A to file with the state the corporations street address of its place of business. The only street address the state of Wyoming requires in the articles of incorporation is the street address of the resident agent. A street address of the corporations place of business is recommended in order to prevent the corporations corporate veil from being pierced. Some suggested use of Wyoming Office Program are, but certainly not limited to, Board of Directors meetings, Stockholders meetings, presentation meetings, conferences with people assembled in Wyoming for the purpose of doing business in Wyoming from throughout the U.S. and foreign countries, consummating and executing major agreements and financial transactions, having such items and transactions witnessed and notarized in the State of Wyoming, routine office work dictation, reading writing, meetings, etc. You will sign a Lease agreement with us giving you option an to use our address, get mail forwarded and use office facilities including conference / board room. 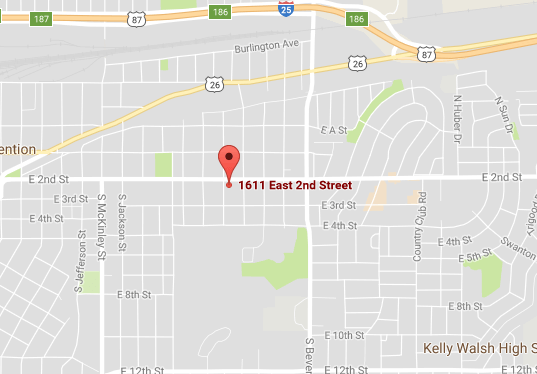 Our office is located at 1611 E 2nd St, Casper, WY.